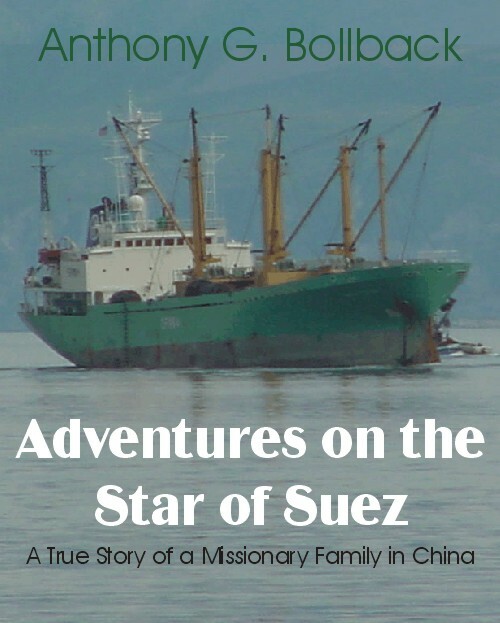 This true story of the Bollback family and their forced evacuation from China on the Star of Suez will captivate young readers. They will learn that it always pays to follow the Lord no matter how difficult, and that He never forsakes His children. A great challenge to follow Jesus. The night shadows deepened and the lights of the city [of Shanghai] twinkled brightly. All seemed peaceful and still. The 42 missionaries on board had been gathering for prayer each evening [on board the Star of Suez]. On this night they prayed for God’s protection as the captain attempted to run the blockade. Then just as suddenly as the ships passed in the darkness, they reappeared from behind. When they were broadside of the Star of Suez, they turned on powerful search lights and played them over the deck and the passengers standing at the rail. The rattle of machine gun fire pierced the cool night air, and tracer bullets lit up the darkness like a fourth of July fireworks display. Everyone scrambled toward the lounge and fell to the deck to avoid the possibility of shots coming through the large windows of the lounge. Everyone lay on the floor, hearts pounding. A medical missionary doctor appeared in the doorway carrying his sick baby daughter on a pillow. He knelt down and crawled into the lounge pushing the pillow along the floor to the side of his wife. Not knowing what would happen next, the children huddled close to their parents. Everyone was praying to the Lord for His protection in this emergency. The ship sped toward the ocean. More gun fire. This time it was across the bow of the ship accompanied by the warning voice of the captain of the navy ship booming out a command to stop. More machine gun fire across the bow of our ship! It seemed like hours passed before the ship’s engines ceased throbbing. Actually, it was only a few minutes. The captain of the Stat of Suez knew he was trapped and for the safety of the ship and the passengers, he signaled that they would surrender. With that, a dozen neatly dressed navy officers entered the room and politely informed the passengers not to worry about anything. Each family was asked to approach the table where the officers were examining passports. When our turn came, we walked slowly to the table to show our passport to the men sitting there. No one said a word. The official looked at everything carefully, then looked up again to see the family standing there, and finally back to the passport.